HTML and CSS are the languages that are used to write content for the web. Does it make sense for children to learn HTML and CSS? If so, at what age? Lots of coding clubs and schools around the world are teaching children to write webpages using HTML and CSS. 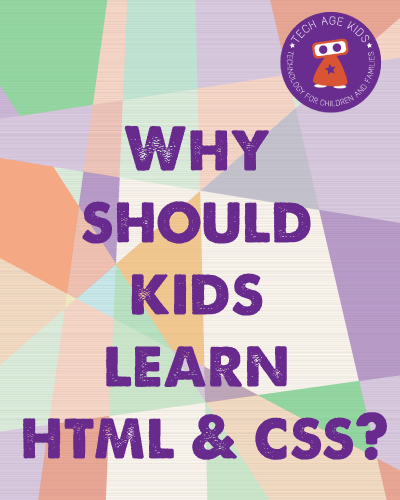 If your child has been learning HTML at school you might be wondering what it's all about. You might be thinking about whether to try and get your child into a club where they can learn web creation skills. Or you might be considering finding resources that will help your child to learn at home. Of course there are lots of things that children should be learning. Is HTML + CSS a high priority? Let's take a look at whether it makes sense for children to learn to create web pages using these languages. And if it is, at what age. HTML is the HyperText Markup Language and it wraps content in tags so that a web browser knows how to display it. HTML is not particularly human-friendly and many people use visual editors to create it so that they don't have to work with the clunky angle brackets. CSS stands for Cascading Style Sheets and it is used to add layout information to HTML. You use CSS to control where items appear on the page, their colour, size, etc. CSS is powerful because it can be written in one place and automatically applied to lots of HTML elements. Why Should Kids Learn HTML? Most HTML isn't written by hand these days. It's either written using a graphical editor (with a word processor style interface) or it's generated using a programming language and content stored in a database. There are people who prefer to write HTML by hand, but it's not a necessary skill to produce a content-based website. So why are kids learning HTML? Does it make sense? One argument is that the web is so prevalent in daily life that kids really should understand what makes it tick just as they should know the basics of car engines and electricity. This is a valid argument but there is more to it. There are also lots of cases where you will want to embed a widget or feature from another website into yours (such as a weather widget) and typically you'll be provided with a chunk of HTML to include in your website. It's useful for website creators to understand what this is and not be fazed when they come across lots of angle brackets. Once you add in CSS then the reasons for learning HTML become more obvious. If you understand the structure of HTML then you can add style instructions that apply across a whole website. This is very powerful. Most websites have interactive features. Many of these are features are coded by modifying HTML and CSS - you need to understand HTML and CSS well to do this. So learning HTML is a really important part of being able to write interactive websites. Remember that we said that a lot of HTML is actual generated by code? Well the people who write that code need to understand HTML so that they can generate it. HTML and CSS are very useful skills for future employees. Lots of jobs now involve creating online content. It is code though. And it teaches kids about structuring data and being precise. CSS is fantastic for teaching abstraction and modularity skills. All good stuff. You don't learn HTML and CSS instead of a programming language. They are complementary. At What Age Should Kids Learn HTML? We'd suggest that age 10 is about right in most cases. Many 8 year olds will be capable of the basics. Some eager kids will be very capable of writing HTML at a younger age and that's brilliant! If they are going to be publishing content online then they also need to understand how to be a good web citizen and be capable of understanding rules for using images and other content that has been created by others. Code Club starts at age 9. Go Berserk has been teaching children from age 8+ and we've tried starter activities with children as young as 7. Won't HTML be Replaced Soon? We always hear that technology changes at a rapid pace. Will HTML still be around when today's 8 year olds are looking for jobs or will it have been replaced with something else? This is a valid concern. HTML has proved pretty resilient so far though. It's been in use since the early 90s and it's so deeply embedded in the web that it's not going to disappear quickly. HTML is being updated all the time to keep up with new demands so it's likely to keep changing and adapting. Even if HTML does get replaced, the skills learned will be transferable. Why not see if there is a children's coding club near you. Coming soon: HTML and CSS learning resources for kids to use at home. Follow Tech Age Kids on Twitter for the latest articles and news.